Check out the latest release from the 300 Entertainment artist. 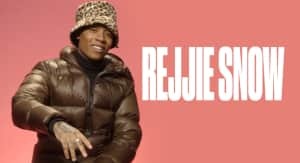 Rejjie Snow has once again teamed up with Kendrick Lamar producer Rahki on new single "Flexin." Snow previously worked with Rahki on previous single "Crooked Cops." "Flexin" is the latest to be taken from Dublin-born Snow's upcoming studio debut, Dear Annie. The album, which doesn't currently have a release date, will come out via 300 Entertainment. Speaking to The FADER in January, Snow also suggested he will release an "art project" with Joey Bada$$ before the album drops. Next up for Snow is a U.K. and European tour that kicks off in Glasgow, Scotland on April 19. Check out "Flexin" above and hit Snow's official website for ticket info and line-ups.